If you've popped across from Gallery Idol you can check out more about my final entry here! I'm trying to get a head-start on all the guy cards I've gotta whip out this month. We have so many guys in the family celebrating their special days in August - good job they picked this month as I have time to figure out where on Earth to start with their cards; whenever I sit to make a guy card I have to have the idea already in my head or else I'll sit there stumped for hours! I love how versatile this sketch it - I can see me using it for a number of different occasions by simply replacing the heart with something else and mixing up the colours. Hope you can hang around for our fabulously fun CASE study blog hop tomorrow! Wow girlie - you are a real crafting demon lately. Check out your challenge card - awesome twine work and great mix with that precious DP. Ooh and watch out Abersoch! Great man card Amy! Love the window and texture behind it and the star with the twine is fabulous! Love this card! How exciting with gallery idol, huh? Are you happy its about to be over? ack!!! You used one of our favorite sets....Star Prints! I am going to CASE this my friend...so stinking fab for a man card! Great use of the sketch! Aimes, this is amazing! I absolutely adore everything you make with the linen impression plate! Beautiful card!!! Love the polka dots on the navy card stock!!! Fabulous card! perfect for the men in your life! Have a wonderful holiday Aimes! 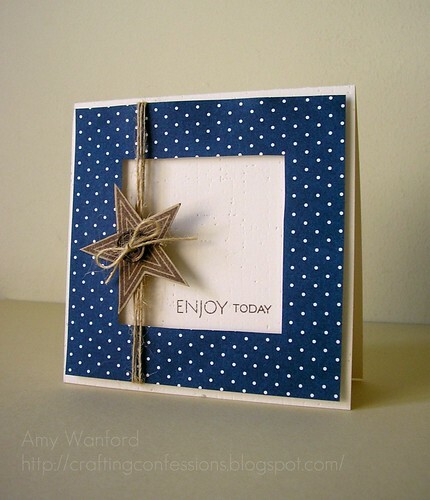 SO cool, Aimes--I love the twine & star! It's a really fantastic guy card. Your vacation sounds heavenly. How wonderful to be able to get away. And finally the last week of Gallery Idol--hope, hope, hope you come out the top winner! Simple and gorgeous Aimes, love the polka frame....I've been trying to overthink this challenge, I'm not so good with PP! Mens cards are always difficult but yours is fantastic, love star prints and the use of twine! What a cute use of patterned paper! Love that star with the twine! Thanks so much for playing along and congrats on your Gallery Idol accomplishments!! Congrats on your win. Love the dotty PP and start with the twine. Digital....not only for the scrapbookers! CASING right back at ya, Diva! If it's not broke, don't fix it....!